There are several different scenarios that can occur in any type of public or private building or space where people may be injured and unable to walk. When a crisis occurs it may be important to immediately remove these injured individuals from a source of danger. When time permits making a 911 call and allowing first responders to handle the injury is always the best option but when fire, earthquakes, storms, flooding or other types of structural damage occurs this may not be an option. Keeping rescue chairs available as part of the standard emergency supplies in any type of public and private buildings and spaces is an important part of being fully prepared. 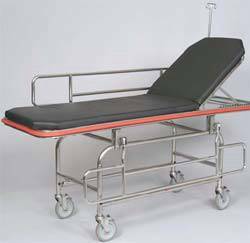 Emergency rescue chairs are designed to be very easy to use, even if you are not a trained first responder. They are designed very much like a standard aluminum framed lawn chair, but some are available without any armrests for even more compact storage and movement in small spaces. The back of the chair has two hand grips that are similar to the back hand grips found on a wheelchair. They do extend back slightly farther to allow additional easy in maneuverability in confined areas. They can also be used to easy move a person up and down stairs, which is very difficult in a standard wheelchair. 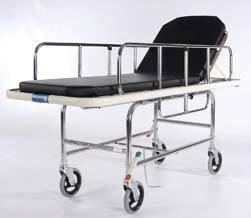 The back legs of the emergency rescue chair are equipped with wheels that feature locking devices for additional stability and security. The front of the chair has one leg on each side that are one solid piece of aluminum forming a "u" shape when viewed from the front. This provides a solid frame for the chair and also a secure way to position the chair when not being moved. Since the front legs are not equipped with wheels the chair will not move on its own or under the power of the person in the chair. Other models may provide small wheels on all four legs with the front wheels swiveling and the back wheels fixed and with braking systems. The front of the chair is equipped with two extended handles that are connected to the back legs, just above the wheels, and are attached to the same side of the front legs, giving additional support to the entire chair. These handles can extend outwards and slightly upward, allowing the chair to be inclined backwards and moved towards a wall or into an elevator or other small space. The person pushing the chair can remain in front so they can easily move around or position the chair against a wall very effectively. The individual in the chair is securely held in place using a variety of harnesses or straps. Emergency rescue chairs often have a similar feature to an airplane or car seatbelt, one that fastens around the chest and one that fastens over the thighs or around the hips. 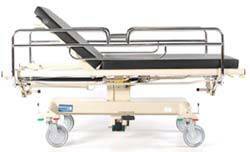 There is also the option to have a harness type of system that allows the patient to be strapped in over each shoulder from the back frame to the belt, providing very secure positioning.